Convenient storage for awkward items. 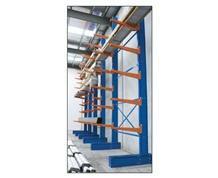 Easily load and unload product using forklift. A great way to organize all your odd items. Adjustable to fit most items. Double sided products are punched on both sides to be able to add extra arms on either side. Ideal for storing lumber or pipe. 10,000 lb. capacity per side.